two + eight = Required Please enter the correct value. WTI oil prices currently hover under $60. That's down 40% from the year-ago high of $98. Natural gas prices have seen a similar decline. They've fallen 38% in the last year and currently trade around $2.50 per million British thermal units (BTUs). But those low prices have primed the oil and gas sectors for a wave of M&A activity, resulting in a new group of heavyweight companies that will lead the market into the "new energy age." Royal Dutch Shell Plc. (NYSE ADR: RDS.A) acquired BG Group (OTCMKTS ADR: BRGYY) for $70 billion in April – the largest energy deal in more than a decade. Last November, Halliburton Co. (NYSE: HAL) snatched up oilfield services competitor Baker Hughes Inc. (NYSE: BHI) for $34.6 billion. 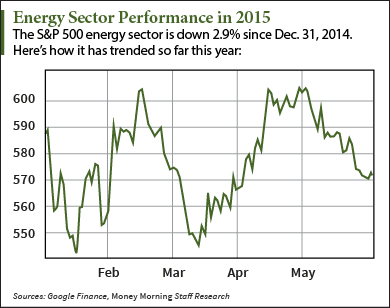 All of the consolidation among energy companies means the market will be a lot leaner by the end of the year. "We will see a restructuring of assets throughout the upstream (production) to midstream (transport and soon export) to downstream (refining and distribution) process," Money Morning's Global Energy Strategist Dr. Kent Moors explains. "All of these will hand us some very nice investment opportunities."